Living here has taught me to make the most of what we already have. It’s really very easy when you learn to do little things each day to save a few bucks. It’s rarely the big grandiose things that make the most financial difference, but the small daily tasks repeated over & over. 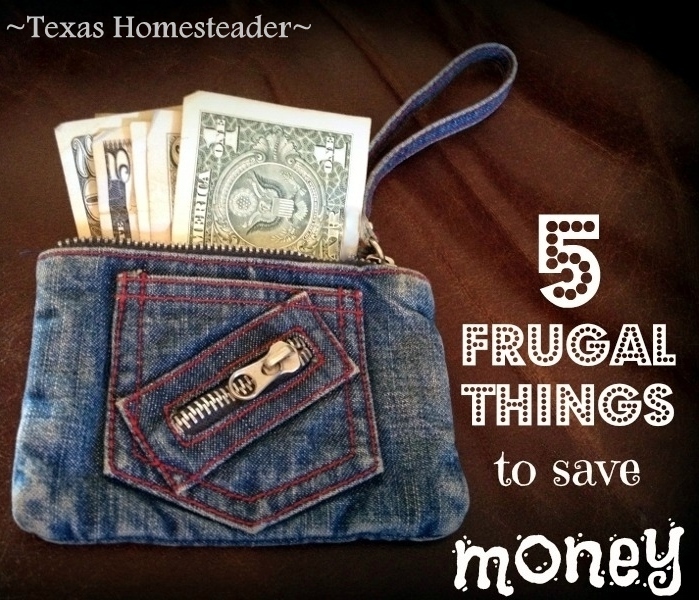 So I’ll share with you 5 frugal things we did this week to save money. It has a nice little side benefit of almost always being gentler on the environment too! We were invited to two family dinner gatherings this week. 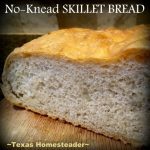 Since they were only a day apart, I decided to make No-Knead Skillet Bread for both gatherings. I simply made the single recipe and divided the dough in half when it was time to bake. The result was a smaller, flatter loaf that was easier to tear apart for dipping. I also infused some olive oil with fresh herbs from my garden, adding a splash of balsamic vinegar. At both gatherings, the bread & oil were very well received. Since we drove into the ‘big city’ for those gatherings, I used the opportunity to visit establishments not available to us out here. You know, bulk stores & such. On this trip I stopped at Winco and bought a 25-lb bag of flour. As always I’ll freeze it for at least 24 hours before storing it in my pantry to make sure I don’t have to deal with pests. We also stopped at a home improvement store to check out some things RancherMan had his eye on, and a clothing store to pick up something for my mom. And we stopped at a farm & ranch store to pick up a few things for our cattle that were priced significantly less than we could buy them in our surrounding area. Batching errands like this saves both gas & time for us. My garden was close to a big, fat bust this year. We received flooding rains just before spring, then almost nothing for the rest of the growing season, throwing us once again into a gripping drought. This was followed by a record wet & soggy September & October. My poor garden never knew what hit it! My harvest was almost nothing all season long. But when the drought was over, my Anaheim pepper bush that I fought tirelessly to keep alive during the drought went c-r-a-z-y! We’re supposed to get our first killing frost of the season & I’ll not let one pepper go to waste! So I harvested everything on that pepper bush and brought all the peppers inside. But what to do with them? When I posed this question there were lots of recommendations on our Facebook Page such as cowboy candy, pickling or fermenting them. Although they’re all good suggestions, I need to preserve them in a way that we’ll actually use them. So I brought them in & diced them up (seeds & all). Even though there were lots of peppers, it was quick work because I used my *Chop Wizard (have I mentioned how much I love this thing??) 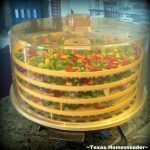 I used the largest chop-sized insert then plopped the chopped peppers on my dehydrator trays. It would have been waaaay overkill for me to pull out my *9-Tray Excalibur for this small task so I just used my backup dehydrator, a standard household-sized unit. After they were dehydrated I put the seeds in a repurposed jar to use in cooking. They’re only mildly spicy so I’ll probably toss a few into my next batch of Cowboy Chili for just a little sumpin’ extra. The dried peppers were ground into powder for a lightly spicy seasoning to use all winter long. I’ve made my own sheer face powder for years. I love that I can adjust the color based on the seasons. I use a small canning jar to hold it, and a large makeup brush to apply it. Now with the winter months coming on I made it just a shade lighter than my summer color. Simple, quick, inexpensive. Yep, that’s how we roll in the Taylor household! We have two tractors – mine is smaller and used mostly for maintenance. But RancherMan’s got the larger one with more horsepower equipped for a heavier workload such as hauling hay. We started noticing that one of his front tires has been going flat often. The last time he hauled hay it gave up the ghost completely and split, spewing a geyser of tractor sealant with every rotation. So he called and got the price for someone to come to our ranch & replace/re-mount the tractor’s front tires. Whew – it was not in our budget! Not to be deterred, RancherMan hit the internet. He ordered 2 front tractor tires from a tire company online. They were shipped Fedex directly to our home. RancherMan removed the front tires & rims from the tractor and took them and the new tires to a local tire shop. They installed the new tires onto our rims and RancherMan brought them back & mounted the new tires onto the tractor. Done & done! No, it’s not a one-stop shop as would have been the case with the onsite job. But by doing it this way he saved over $100! That’s quite a chunk of change saved in our already-tight budget! Of course there were other things throughout the week that we typically do. As always, most of our meals were cooked from scratch, which is always a money saver. And I used the Cook-Once, Eat-Twice method so many nights were still homemade goodness with heat-n-eat convenience. I made RancherMan’s favorite Sandwich Bread out of that bulk flour I bought and whipped up some Homemade Yogurt too. These are just a few examples of ways we’ve been able to incorporate money-saving tasks into our everyday activities. Have you discovered a money-saving task this week too? Share! We can all learn from (and be inspired by) each other! 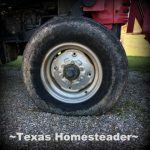 This entry was posted in Blog Posts and tagged Environment, Frugality on November 15, 2018 by Texas Homesteader. I like your plan of batching errands. I try to consolidate shopping trips as I figure mileage from my job pays 56 cents/mile so I factor that into the cost of the trip as an extra 50 odd mile round trip adds roughly an extra $30 to my cost of what I am buying. We froze and canned a good amount this year. We got alot of blueberries and strawberries that we vacuum sealed before freezing. As you know, fresh fruit is expensive and when I pick over 150 quarts of berries from my garden, I save hundreds of dollars. Next year I am planting more tomatoes as the rainy season left a lot of our rotting from the inside. Wasn’t enough to make salsa or sauce. We had a lot of peppers though. My husband gave both boys haircuts last night. Their hair grows so fast they need one every three to four weeks. He is pretty handy with the hair shears as well as the clippers. He doesn’t shave them bald, he uses the different attachments on the clippers and uses the scissors over comb technique for the longer hair on top. Boys look well groomed, I don’t like them looking scruffy, and I would not want them shaved bald either. Easily saves me hundreds a year on their haircuts and mine as well as I take a seat every other month, get caped and have him cut my hair to remove the splits and keep my ends neat. And it saves me a lot of time, I can’t imagine wasting a whole Saturday morning or afternoon rning to the salon. He does a very nice job and my best friend stopped by one afternoon when I was getting my hair trimmed and she said she would leave, she didn’t mean to interrupt, but I told her to stay, we can talk while he cuts my hair. He asked her to sit in one spot so I would be facing her, and would not be turning my head. We chatted and she asked hubby a couple questions about how he was cutting my hair being he had sectioned my hair and was letting it down in increments to trim it. She complimented how nicely my hair looked and casually mentioned she really needed a haircut as she had been busy and was putting off getting hers cut. When hubby finished my hair and was taking the cape off of me, she jokingly said, I’m next! He looked at me, I nodded and he said OK, have a seat. She said, Really? He said yes, what would you like as he caped her. Net result was she was very happy with her free haircut and asked if it was a one time good deal or could she stop by for future haircuts. So she now asks when hubby is going to do my hair, so she can get hers cut too. So I am a pal sharing my stylist with her. She likes his work as well as the fact she is getting free haircuts. A productive hunting season put two deer in our freezer, so hubby’s hobby of deer hunting had a good yield this year. Healthy eating free range, hormone free meat that is delicious that can be cooked so many ways. Well after ten years of cutting his hair every three to four weeks, you have easily done well over a hundred haircuts and saved a couple thousand dollars. My mother loves seeing my boys with their hair short and always fawns over how handsome they look after they had gotten a haircut. She figured between the cost of the haircuts, tip and transportation costs, it is about $500 a year I am not spending on their haircuts. And about the same amount for my hair alone. I can fully understand being nervous about doing haircuts as I bought the set of Wahl clippers with the intention that I was going to be the family barber and cut all the males hair. I was tired of taking the boys to the barbershop and paying for bad haircuts. Well I got flustered doing my oldest son’s hair the first time and had hubby finish, the same with my younger one and the next time, neither would let me cut their hair. They both wanted him to cut their hair, so it became his job. He is very meticulous, always does a great job and has told me it is easier to cut my hair than the boys’. I really appreciate the fact he has a knack for it because I hated seeing my boys have bad haircuts and I have had a couple friends stop by to watch how hubby does them. My one friend is a single mother who has three boys, so she was spending alot for their monthly haircuts and is now getting a lot of practice doing her three sons and boyfriend each month. The other has a son and daughter and felt comfortable cutting her son’s hair with clippers, but using the shears on her daughter’s hair she said she didn’t trust herself to do, which is probably best for her daughter. I have seen some bad haircuts on children by mothers who should not be cutting hair. My best friend always compliments him on how nice he cuts her hair and tells him he is the only one she will trust to cut her hair, so hubby does like having his ego stroked, so he is not going to tell her that he won’t cut her hair. I have heard about the wild pigs down in Texas, Mississippi and Alabama get quite large and wreck havoc on gardens and farms, so there is no closed season on them, you can shoot as many as you want. Depending on space in your freezer, and if you have friends/family who will take your extras. Two years ago, hubby got three deer between the bow and rifle season and while I love venison, I did get tired of having it for dinner 4-5 nights a week and welcomed a change. I’ll have to try that, do you heat to the same temp, and ice it down before puttyit in the oven? I did get a Salton yogurt maker at Goodwill a while back and made a batch in it. I always use your yogurt recipe, when I make it. It isn’t as much now because I ended up with a long term subbing job. This means I can’t just put in a no call day, when I want to do something. I did end up making several pints each of pears and vanilla pears. Then when apple season came I ended up with about fifteen or twenty pints of applesauce. Although Everytime I go past Tacoma Boys store and see honey crisp apples by the 20 pound box, I’m tempted. But I got my apples for free. And Bartlett pears grow up here, too. So when I got those they were dirt cheap. I did try making your recipe for apple pie filling. I made 4 Qts, but when I took them out of the canner for cooling, two started bubbling over. After looking it up on the internet I found out that’s fairly common, and if you let them cool in the water it doesn’t usually happen. So I’ll be looking into it more and possibly make it again next year. Oh yeah, and I made a small batch of pickled beets, too. That’s pretty much the extent of my canning this year. Right now I’m “pinning” to see what I can make for Christmas for Kaleigh’s teacher. I hope you had a great Thanksgiving. Say hello to everyone, we miss everyone. I was really surprised how easy yogurt is to make when I first tried it a couple of years ago. A friend of mine did some testing on how much starter to use, and she discovered the yogurt actually got thicker using just 2 tablespoons of starter. In my experience, the longer you culture it the thicker it gets, and whole milk also tends to be thicker. I only use milk and starter, no powdered milk. I used to culture mine for about 12 hours (overnight) by keeping it all in one batch and wrapping the container in a thick towel, then putting it in the oven overnight with just the light on. I like Greek yogurt so after it cultures and then cools in the fridge, I strain it for about 4 hours through a cheesecloth lined strainer set over a deep bowl or pot. This concentrates the protein in the yogurt and the whey can be used in lots of things including making bread. If you strain it long enough, it becomes yogurt cheese and you can use it as a substitute for cream cheese. I finally broke down and bought myself an Instant Pot after about two years of urging by all my grown kids and grandkids (they all had one and loved it). One of my regular things I use it for is to make yogurt. You still heat the milk (the IP will do it for you), cool it, add starter and then put it back in the base and select the special setting that keeps it at a perfect culturing temp (about 106 degrees). I am lactose intolerant and tend to have a problem with most yogurt, so I read that if you culture it for closer to 24 hours, it has very little lactose left. It would be very difficult to keep at that perfect temp in the oven, and I would be scared of the safety factor. I made some and cultured it for 21 hours, and it was fine. It was much thicker and also more tart (which I expected). I did still strain it for a couple of hours, and ended up with much less whey. Supposedly the longer you culture it, the more probiotics it has. I haven’t had any problem with my lactose intolerance when eating it. I am not advocating you run out and buy an Instant Pot, although I love mine and use it all the time even though I live alone and try to eat only good healthy food. Great idea for saving money on the tractor tires! I love your sandwich bread recipe, but never got around to making the yogurt one–I feel a project coming on!